Moving from a big city to a small town is a culture shock. In big cities, you are anonymous, but in small towns, most of the people grew up together, and therefore know each other's history. Big city people must learn to be careful about what to say. Before the internet came about, in a small town, the best way to hear all the news was through the gossips. If a rumor is spread around that doesn't quite mesh with one's past experiences, it can be rebuffed, but past histories also include disputes and prejudice, and even acts of revenge. Relationships can get nasty. Schools are microcosms of a town. How many young people look forward to the day they can move out of town, to the big cities where they are anonymous? But, business relationships can be difficult, too. The same crises occur on every level. The internet allows the spread of gossip, and relationships are still nasty. Hinduism focuses on security, and Diwali is about how to protect yourself and your family from the rumors and prejudice of the gossips. When it is a matter of revenge, and the rumors become nasty, how do you protect yourself? Character defamation is an individual form of genocide, and genocides are based on weaving an illusion. Once the Grand Lie has gone out, the truth doesn't overcome the lie, it just reaches the point where no one knows who to trust. It reaches the point where everything is log-jammed, and when new people are dragged into the illusion, they reinforce the lies. Eventually, societies become stagnant and corrupt, the natural progress slows, and eventually grinds to a halt. This is how nations become failed states. At this point, the only thing you can trust is Universal Law, which stands on seven principles--equality, liberty, freedom, compassion, abundance, capacity and tolerance. These principles allow for a sense of balance to be reinstated into the society. 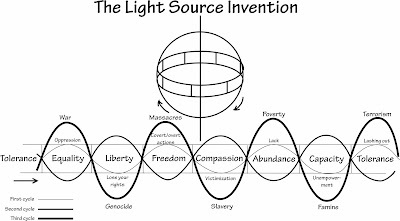 The diagram of the Light Source Invention is not new. It is based on prayer wheels, which are used by many religious Asians to remind them of the principles of their religion. President Trump calls the media "fake news." His supporters trust him to make our nation great again, and to create a sense of prosperity for them. When you put your life in the hands of someone or something that cannot help you get your life, eventually, you realize that institution or individual cannot help you, and you hit the point of the Brick Wall. You lose your identity, you become part of a class of people, such as an alcoholic or cancer victim or drug addict or homeless, and you spiral down into the abyss. To rise out of it, you must stop relying on whatever it is, let go of the fear that led you to play the compensatory power game that led you to believe you cannot get the life you want, and you must assume responsibility for your own life. You must overcome your fear of failure, loss or death. In the era of world peace, everyone will function based on their own capacity, and this understanding allows the society to overcome the devolution into the abyss. The Faith of the Pure Ray is the first step in the second row of the World Peace Marketing Strategy, and is designed for people who wish to establish a financial foundation. The economic foundation of the international government is that everyone functions based on one's talents and gifts, which everyone has, no matter where they stand in society. Even displaced people, homeless people, have something to offer. Donald Trump is functioning outside of his capacity. He is a businessman that has no prior government experience. When you function outside of your capacity, you reach the point where everything you do makes the crisis worse. Donald Trump has surrounded himself with people based on loyalty to him, not necessarily their capacity to do the job, and therefore, it will be very difficult for him to rise out of his crisis. It will take a miracle for him to rise out of his crisis, and this is the point where we reach a crossroads as students. We can come to the understanding that our plan never had the capacity to get our life, because we are functioning outside of our capacity, and come up with a plan that benefits everyone. We can keep the same plan and continue on around the planning circle, and learn the principles of Confucianism, which is based on functioning from one's capacity, or we can choose to move forward to the next step in the World Peace Marketing Strategy, which focuses on miracles.